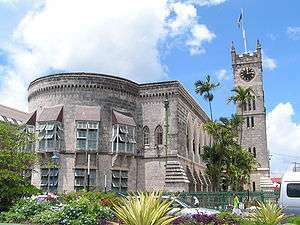 The west-wing of the Parliament of Barbados (1872) is constructed of local coral rag. Coral rag is a rubbly limestone composed of ancient coral reef material. The term also refers to the building blocks quarried from these strata, which are an important local building material in areas such as the coast of East Africa and the southeastern United States littoral (e.g. Florida, Bermuda). It is also the name of a member — the Coral Rag Member — of the Upper Oxfordian Coralline Oolite Formation of North Yorkshire, England. Wikimedia Commons has media related to Coral rag.